ST. GEORGE — A Washington City woman who worked for the town of Apple Valley for five weeks allegedly paid herself for overtime she never worked, gave herself pay raises and deposited checks written to other vendors into her own account, according to charges filed Thursday in 5th District Court. She also nearly got away with an $8,100 severance check that was stopped by town officials, police say. 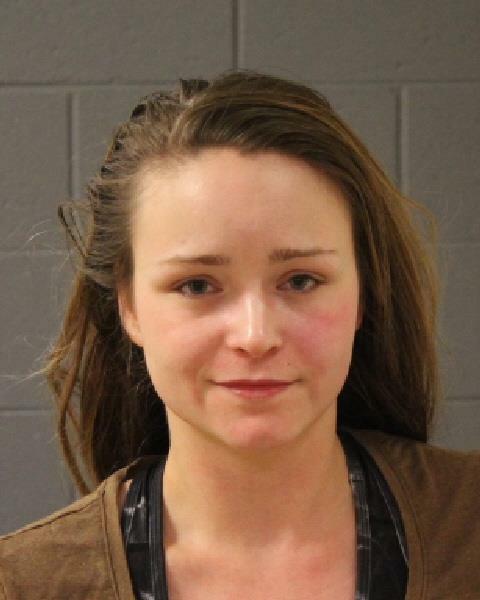 Amanda Walker, 26, is charged with one second-degree felony count of theft and one third-degree felony count of forgery, according to court documents. She also was charged with four class B misdemeanors – one count of official misconduct and three counts of falsifying/altering government records. Washington County Sheriff’s detectives responded Nov. 6 to a report of embezzlement by a former employee of the town of Apple Valley, identified as Walker, who had been hired as the town’s accountant five weeks earlier. Walker “dealt with an array of financial matters for the town government,” Washington County Sheriff’s Sgt. Nate Abbot told St. George News Thursday. Town officials told detectives that Walker allegedly gave herself unauthorized pay increases, falsified timecards and attempted to grant severance pay on her own behalf. All activities were unauthorized and the total amount in dispute is in excess of $5,000. They also claim that Walker deposited a check directly into her own account that was made payable to the city prosecutor’s law firm. On the morning of Nov. 6, Walker left work shortly after she was confronted by town administrators regarding work issues and her job performance. They were later informed that Walker had no intention of returning. Concerned over the state of the bookkeeping records that Walker maintained, administrators had the records audited. Several ledger discrepancies were discovered, including a payroll check for nearly $8,100 that was to be direct deposited into Walker’s account. They also found that Walker’s hourly pay had increased from $17 an hour to $20 an hour, and she allegedly paid herself for 48 hours of overtime that was never performed. The severance package and pay raise were not authorized by town officials, who placed a stop payment on the $8,100 check before it was deposited in Walker’s account. Going further back into the records, officials found that Walker had also paid herself more than $400 in overtime in October, even though she “always arrived late and left early,” court records say. There were several days where Walker missed work altogether, but her timecard showed a full week worked with overtime. There was evidence of other fraudulent checks, one of which was issued by Walker to the prosecutor’s law firm in the amount of $1,130, which was cashed but never received by the firm. Surveillance footage showed that the checks were deposited directly into Walker’s account. Walker’s personnel file and copies of her timecards were missing after she left work Nov. 6. Detectives went to Walker’s home and found a U-Haul trailer in the driveway, and later learned that Walker and her family were planning to move to Cheyenne, Wyoming, the following day. After obtaining a search warrant, police entered the residence and found Walker inside with her two young daughters. She also denied all allegations against her and showed detectives a photo stored on her cell phone of a letter of termination on Apple Valley letterhead that granted a severance package of $5,500, but the letter had only a typed signature. Police also found a photo of the $1,130 check written out to the city prosecutor that Walker allegedly deposited into her own account. She would not admit to signing the check but told investigators that she wanted to return the money. Walker was arrested and transported to Purgatory Correctional Facility where she was held on $17,040 bail. She was released Thursday after posting a bail bond and is scheduled to appear in 5th District Court Dec. 4 at 1:30 p.m.
Abbott said that with the active investigation the decision to make the arrest on Wednesday was largely due to circumstances surrounding the case. He added that further details will come to light as the investigation continues and could result in further charges, but said he was not at liberty to release any information at this time. Why does Apple Valley have a city prosecutor? Have they got a court house now? A police station? Hmmmmm I wonder if she was a liberal? Such ignorance. As if political affiliation has anything to do with embezzling thousands of dollars. Get real. Than kn s for the article. It answered the questions I had when I saw her booking photo and charges. Been hanging out on that website that publicly humiliates people, eh? Life moves pretty slow around the ladybug household. One thing I’ve noticed about this area since I moved here over a decade ago, is it’s a small world. Once someone hears something juicy, it’s not long before EVERYONE finds out. Doesn’t matter how big or small the news is, it spreads like wildfire! A very stark contrast to where I lived before. Jealous? Lol. I keep looking for Karma. Jealous of what? Having little to no life and sitting around looking at people’s arrest records? Please… what do I have to be jealous of again? Glad to see she is finally being held accountable for her lying and dishonest behavior! She’s a pathological liar and the funny thing is that the day after this all went down she was in court lying to a judge about another con she was trying to pull off. Sad thing is that her girls are going to be the ones who get hurt most. Hopefully justice will be served! Agree completely with the pathological liar part. Curious about the other incident you are referring to. Haven’t heard and can’t find anything online. Thanks in advance! She had a small claims court appearance the next day for having 2 dogs destroy the carpeting in a house that she and her boyfriend were renting. She had her 2 girls in the courtroom and must have instructed them to lie to the judge about owning dogs because the plaintiffs had pics of the animal stained carpeting. She is a real piece of work. And yes, without question, a pathological liar. Her court date was Tuesday 1/15. Any update on the outcome?